Mankind has created artistic images of the world around him ever since the beginning of recorded history. Starting with the first smelting of metals, sculptures have been part of man's attempt to add beauty to his existence. 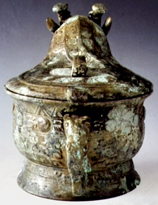 Bronze sculptures have been found in the ruins of the ancient cities of Mesopotamia, in the burial tombs of Chinese emperors, and at the great Roman towns of Pompeii and Herculaneum. This art form was lost for centuries but during the Renaissance period bronze sculptures again came to the forefront of art. Another four centuries would pass before the birth of the Industrial Revolution in the mid 19th century. This Industrial Revolution would provide the tools necessary to make bronze sculptures available in editions that would vault them to the top of the art world once again. Foundries sprang up in the city of Paris in the middle of the 19th century whose sole purpose was to cast editions of bronze sculptures for the hundreds of artists who specialized in bronze. Artists flocked to Paris from all points of the globe to study and have their sculptures cast in bronze. This artistic magnetism resulted in the creation of bronze sculptures whose beauty and grandeur have never been seen in modern times. Never before or since has a single form of art held so many captivated in its trance as bronze did in Paris of the mid 1800's.